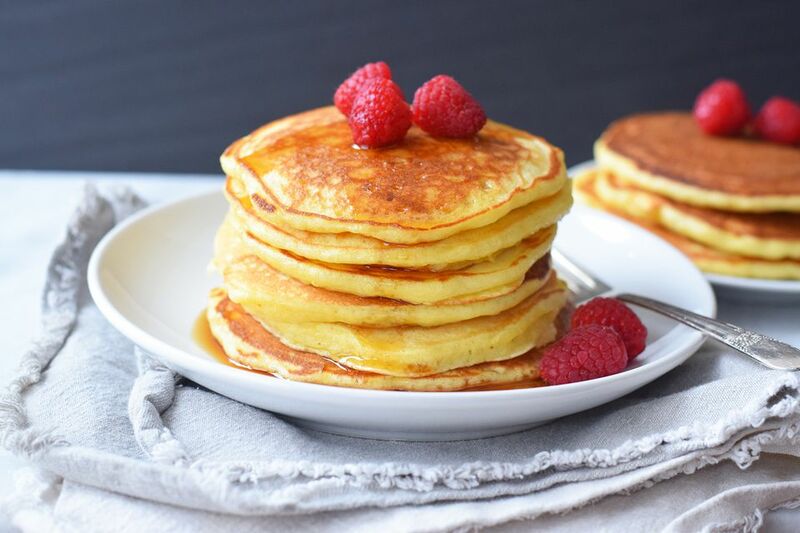 Sourdough pancakes are the pancake recipe you didn't know you needed! They are a great way to mix up your normal Saturday morning pancake routine. You will be surprised by their perfectly fluffy texture and sweet and tangy flavor. They are soft, tender and pleasantly chewy all at the same time. They are worth the little bit of extra effort, especially if you already have sourdough starter in your refrigerator. You just need to leave the base of the pancakes on the countertop overnight and let it bubble. Then, in the morning, you throw in the other ingredients and get to cooking them and then, of course, eating them. We served these pancakes with some fresh berries and real maple syrup, but you could top them with powdered sugar, butter, or fruit syrups. Combine the sourdough starter with the milk and the flour in a large bowl. You need a good sized bowl to allow the mixture to rise. Cover the bowl with plastic wrap and leave it on the counter overnight. It needs to rise and continue to develop its sourdough flavor. This will be your overnight sponge, the base for the pancakes! Add the beaten eggs, baking powder, sugar, and salt to the sourdough starter mixture after you have let it sit overnight. Whisk the ingredients until combined and smooth. Whisk in the melted butter and vanilla extract. Make sure the melted butter has cooled slightly before adding it to the batter. It will be very thick and almost bread dough-like after you are done mixing. Heat up a cast-iron skillet or griddle and grease it. If you use a griddle you can cook several pancakes at a time. Nonstick surfaces are best for cooking pancakes. Turn the heat down to medium-low, add the batter to the skillet and cook for a few minutes or until the bubbles start forming. You can make these pancakes as large or as small as you want. Even the big ones are very easy to flip. Flip the pancake over and cook for another minute on the other side. It doesn't take as long on the second side, so just watch it carefully. Serve a nice stack of the pancakes with fresh berries and maple syrup. Butter is always good too. It's important to keep the heat low while cooking these pancakes. They can burn easily as they take a little time to cook through due to the thick batter.